One thing we love doing over here at the Beer Lab is experimenting with fun ingredients and unique processes. This has led us to create beers with tomatillos, candy cap mushrooms, donuts, basil, and all sorts of fruit. However, that same curiosity that leads us to try new and trendy styles and ingredients can also provide a desire to recreate historic styles using old world brewing methods and ingredients. Thus, we are excited to launch the first beer in our new Temporal Displacement series. The idea behind this series is that each beer we brew will be based on research and findings of historical beers brewed in different regions of the world and in various time periods. We make no promises that the beers we create will be exact replicas of these historical beers. How could they be? Instead, we are going to learn from the research and findings of beer historians and recreate these beers, while also taking some of our own creative liberties. We hope to bring you small batch beers based on the historic beers of England, the American colonies, Germany, Belgium, and other regions of the world. Most of these beers will be done on our pilot system in 10-gallon batches because they are very experimental in nature and often use brewing techniques that would be difficult to recreate on our larger system. However, don't be surprised if we scale up some of your favorites. The recipe discovered by Mouer is for "Ms. Cary's Good Ale." You can read more about Mouer's research and recreation of this recipe on his website. Our version has a few slight variations from the original recipe. Since malt is no longer kilned in the same way it would have been in the 1700s, we tried to recreate a similar profile by using a blend of English pale malt, amber malt, and brown malt. We also added in just a hint of applewood smoked malt to recreate the subtle smoke flavor that would have come from the malting and kilning process in the 18th century. We achieved a dark color without using any highly roasted malts, since they would not have been available at the time, as the modern roasting kiln had not yet been developed. The beer is a malt-forward beer with big, rich flavors of coffee, toast, chocolate, leather, vanilla, plum, and a subtle hint of smoke. 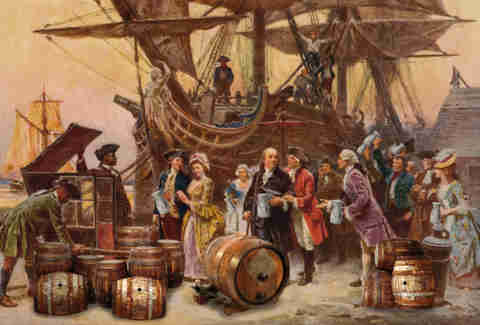 It is very lightly hopped, as hops were expensive and not as readily available in the colonies at the time. A long boil also provided some added sweetness and complexity from caramelization. We hope this beer, and every beer in the Temporal Displacement series, will transport you back in time and provide a unique beer drinking experience that is unlike anything being served at other breweries today.